Logan enjoying the freedom of his paddock. 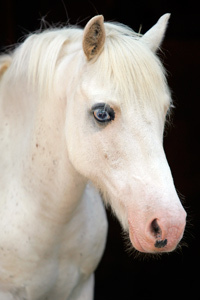 Logan is a stunning blue-eyed paint pony who has led a tortured life. 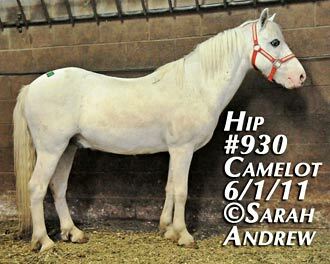 He has been through two auctions, and was purchased by a barn in NJ who hoped to use him for lessons. He was thought to be 8 or 9, but he is actually in his late teens. They found him to be terrified of people and dangerous to ride. They said he threw temper tantrums when ridden, and the children were afraid of him. My first thought was that he had to be in pain somewhere. 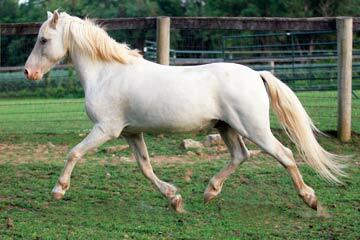 The barn would not keep him, and he was in danger of going back to the auction for a 3rd time. After seeing his photo, I wondered if he, like our Cloudy, suffered from pain in his neck. We had to help this pony, he had no where else to go. We believe Logan was used as a driving pony; the way he carries his head and neck suggests he was fitted in a very tight head set. The vet determined upon palpation he is very painful in his neck, which would explain his bad behavior when being ridden. Logan is not a dangerous pony. He is so afraid he will be hit in the face or beaten. He is currently living in a small paddock with a shed. Above is a photo of Logan when he was at the auction. He doesn’t want to be touched, and protects his face and head anytime you go near him. My goal is to have him come to us willingly, knowing he can get away, so I have been working with him consistently, and he will walk to me now. He is afraid of being brushed, and quivers or shakes, seemingly expecting something painful. We bought the softest brushes hoping that brushing will become a more pleasant experience. I can now catch him to fix his fly mask or put his halter on, although he will still protect his face. He really wants to trust; there is just so much damage to overcome. He nickers to us at feeding time, and seems more comfortable now. I spend time with him late at night and he will relax as I stroke his neck and back. One thing I know with Logan is that our victories will be measured in small steps. Logan truly represents what Mylestone Equine Rescue stands for, creating a milestone in the lives of the horses we save. Won't you please help him out and donate to Logan's care or sponsor him. For additional photos and story, visit Logan's profile page.